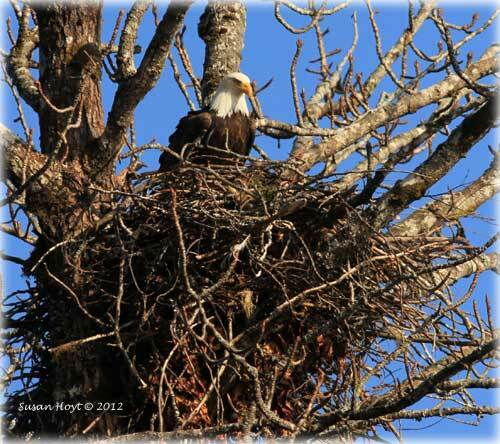 In their new nest south of Ketchikan, both eagles are together in the nest with only one visible in this photograph. Feature: Founder of Prince Rupert died on the Titanic 100 years ago By DAVE KIFFER - A century ago, Charles Melville Hays had big plans for the tiny city of Prince Rupert. Public domain in the United States. This applies to U.S. works where the copyright has expired, often because its first publication occurred prior to January 1, 1923. Rupert was Hay’s baby, a community that the Canadian railroad titan saw as someday being as important as Seattle and Vancouver. He had chosen Kaien Island on the northwestern coast of British Columbia for the terminus of the second Canadian trans-continental railway because it was several days sailing closer to Asia. Then, on April 10, 1912, he boarded the Titanic. 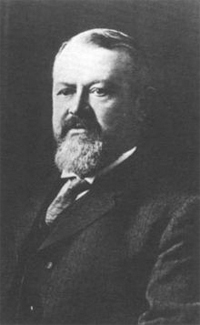 Like several other important Canadian railroad pioneers, Charles Melville Hays was actually American, born on May 16, 1856 in Rock Island, Illinois and raised in St. Joseph, Missouri. When he was 17 he went to work for the Missouri Pacific Railway and by 1884 he was working his way up in the hierarchy of the Wabash, St. Louis and Pacific Railway. He became general manager of the entire line in 1889. In 1895, American financier J.P. Morgan recommended Hays for the job of leading the Grand Trunk Railway, a Canadian-American company that was financed largely by British investors. Ironically, among Morgan’s other business interests was the International Mercantile Marine Company, which later controlled the White Star Line, the owners of the Titanic. With the board of directors of the Grand Trunk living mostly in London, it was decided that General Manager L.J. Sergeant should move to England to advise the board on railroad matters and Hays was asked to fill the position of day-to-day management of the line back in Canada. Hays moved to Montreal to manage the line. “His experience and contacts with American railways helped Grand Trunk sign advantageous agreements with connecting roads in the USA,” Murphy wrote, adding that Hays also built grain facilities in Montreal and Maine to boost shipping on the line. Hays left the Grand Trunk in 1901 to become the president of the Southern Pacific Railway, but returned only a few months later with increased job duties at Grand Trunk. By 1902, he had turned a half million dollar operating loss on his arrival to a $1 million surplus. In 1903, he led the line into its most significant expansion; one that would be considered highly controversial a decade later when Grand Trunk suffered financial reverses and eventually went bankrupt. Nearly 30 years before, the Canadian Government had tried to convince the Grand Trunk to undertake Canada’s first cross-country line and the company had deferred. That line was eventually built to Vancouver by the Canadian Pacific. Alaska: Polar Bears in Alaska Observed with Patchy Hair Loss and other Skin Lesions - In the past two weeks, 9 polar bears in the southern Beaufort Sea region near Barrow were observed with alopecia, or loss of fur, and other skin lesions. The animals were otherwise healthy in appearance and behavior. The cause and significance of the observed lesions are unknown. Alopecia has been reported in both wild and captive animals in the past. U.S. Geological Survey scientists have collected blood and tissues samples from afflicted polar bears to investigate the cause of the symptoms and determine whether there is any relationship between the symptoms observed in polar bears and those reported for arctic pinnipeds from the same geographical region earlier this year. Evidence of alopecia and other skin lesions may be difficult to see unless the bear can be observed closely. 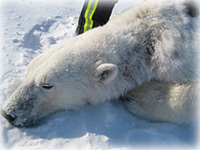 In the polar bears that USGS has observed to date, the most common areas affected include the muzzle and face, eyes, ears and neck. The bear in the photo has hair loss and oozing sores on the left side of its neck. The bear was captured by USGS scientists using the immobilizing drug Telazol. Research scientists with the USGS made the observations at the start of their 2012 field-work season. USGS observes polar bears annually in the southern Beaufort Sea region as part of a long-term research program. This bear population ranges from Barrow in Alaska east to the Tuktoyuktuk region of Canada. Thank you for your patience and for the letters. BOYCOTT ETCH A SKETCH By David G. Hanger - Pass this message forward via email, facebook, tweets & twitters, whatever. Don’t buy a single Etch A Sketch; trash any of recent vintage that you have. They are the product of slave labor. - More..